Are you thinking of buying a washing machine? With so many products out there, choosing the right machine for your household can be a daunting process. Your budget will influence the brand and model that you choose, and you’ll also need to decide whether a front or top loader best matches your needs. 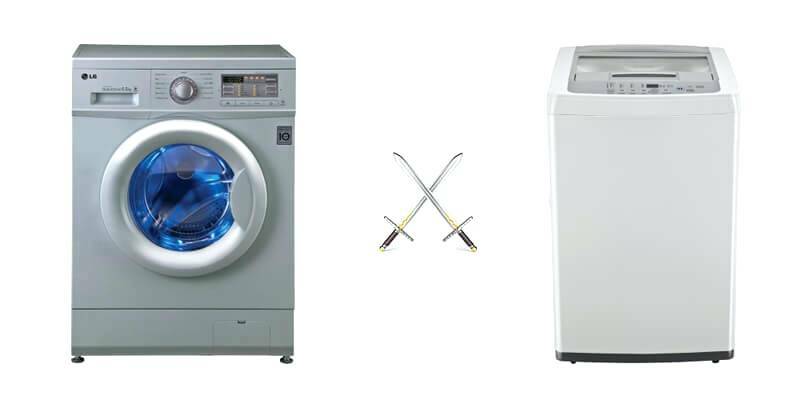 The economic consumption of water and power is an important consideration when you’re choosing a new washing machine. Not only does the economy of the machine influence its running costs, it also has an impact on the environment. Water is a precious resource so it’s important not to waste it. Front loader machines usually use less water than top loader variations do. Front loader models also need less electricity to run. The reduced amount of water in these machines means that less energy is needed to heat the water, ultimately resulting in significantly lower energy consumption. A cold wash can typically be used 80% of the time however, if you have heavily soiled clothing you may want to use a hot wash on a longer cycle. The size of the washing machine you choose will depend on the space that’s available in your home. It will also depend on the number of people that are living in your household and how big your loads of washing are. Front loaders typically have a smaller capacity than top loaders. The compact size of front loaders makes them convenient to use in smaller homes. Before you start shopping, work out how much you can afford to spend on a washing machine. Once you know how much you have to spend, you can start looking for machines that fall within your price range. The brand, as well as the model of the machine, will impact its price. The number of features it has will also influence how much you’ll need to spend. Before you choose a machine, review a range of models to see what features are available. Make a list of the must-have features as well as the features you would like to have. Once you have a better idea of what features are available, you can make an informed decision on which machine to buy. Special wash modes add convenience and efficiency to keeping your clothes clean. Models are available that can be used to wash wool jerseys without damaging them and other machines are ideal for keeping silk clean. If you own numerous delicate pieces of clothes, you will need to look for a machine that has a hand washing cycle. If you plan to place the machine in your home it’s beneficial to invest in a quieter model that offers low levels of vibration. Direct drive washing machines are suitable in this case. Depending on where you plan to place your machine, the style of the model you buy may be important to you. Consider whether the design of the machine matches the aesthetics of your kitchen/laundry before you make a purchase. Remember, top loaders cannot be used under counter like front loaders can. It’s advisable to buy a good quality washing machine from a reputable brand. While a premium machine may require a larger investment initially, it will save you money in the long run. A durable machine lasts longer and it continues to deliver an efficient performance for a longer period of time. Unknown brands or considerably cheaper machines can be difficult to service and repair. Spare parts are not always readily available on these machines and warranties are often for a shorter period. In South Africa, brands such as LG, Defy, Samsung and Bosch are recommended. Regardless of the machine that you buy, make sure that you clean it at regular intervals by running a cycle with an empty load. If you have a front loader, you’ll also need to check the door for mould. Keep the door of the machine open when not in use, this will help reducing musty odors.